Located in the grounds of the former schoolhouse in Padstow, Number 14 is a modern end of terrace property only five minutes walk to Padstow Harbour with stunning estuary views from the living room and upstairs bedrooms. Recently fully refurbished throughout to an exceptionally high standard the property features 2 x double bedrooms and 1 further bedroom with bunk beds. There is a family bathroom, an en-suite from the master bedroom and a downstairs cloakroom w/c. The kitchen is fully equipped featuring an induction hob, cooker, microwave, fridge freezer, washer/dryer and dishwasher as well as an ample selection of crockery, cutlery and glassware. The living room has sofas and beanbags for relaxing on as well as an Internet TV, iPod dock and a Playstation 3 with a selection of games and films + 2 controllers. Outside there is a sunny, private patio with garden furniture accessed from the car park or from the living room. The property has its own car parking space adjacent. As a child we enjoyed holidays in North Cornwall every summer - and even though I am reliably informed that the sun did not always shine, my only memories are of playing on a sunny beach, eating ice creams and hoping for scampi and chips in a basket for tea! We are now lucky enough to own our own property in the town and are thrilled to be able to share this fantastic place with Cornwall first-timers as well as regulars. North Cornwall holds a special place in our families hearts' and we hope you enjoy your stay in this lovely part of the UK - even if the sun does not always shine! Old School Court is an ideal location from which to enjoy a holiday in Padstow. It is near enough to the town, and all of it's attractions and restaurants, to be accessible within a five minute walk but is far enough away from the noise and hustle to make it a quiet and peaceful retreat. With stunning estuary views from the living areas and 2 of the bedrooms plus the fact that we have recently refurbished every room in the house to an exceptionally high standard mean that this holiday home is hard to beat. Number 14 has its own private parking space adjacent to the property. 1 x 2 seater settee & 1 x 3 seater settee. 2 bean bags. Coffee table, TV (freeview + internet access), dining table, 6 chairs. Playstation3 + Games & DVDs. Electric fire. Bose iPod dock. Glazed double doors with estuary view onto a private patio garden. Recently refurbished Shaker style fully equipped to a high standard featuring built-in induction hob and oven (extractor above), microwave, fridge/freezer, toaster, washing machine with integrated dryer and dishwasher. Full range of crockery and utensils. The nearest golf courses are Trevose which is approx. 2 miles drive away or alternatively St. Enodoc is located at Rock accessible via the Padstow/Rock ferry or by car 14 miles. Notes on accommodation: Sorry, no pets. The property is non-smoking. Booking by email or phone or via Home Away. 25% deposit is required after which confirmation will be sent along with detailed information about Padstow. Final payment (which includes a £200 refundable security deposit) is requested 45 days ahead of your holiday. Entry to house is via access to a key safe. Outside: Small shrub bed to front. Parking for one car adjacent to the property. To the rear is a small enclosed garden with patio, patio table and 6 chairs, gate to back path. Cleaning / Towels / Linen / Maid service: Bed linen and towels are included. All linen and towels will be replaced weekly. Full clean done before arrival - mid-stay clean by arrangement directly with housekeeper. Great accommodation, everything was of a high standard and ideally located for walking into Padstow. It is always great to hear that people enjoy the (suberb!) location of our house and the fact that you found everything to a high standard is fantastic to hear. Thank you. Thank you for your kind comments - it is always a pleasure to welcome you to our home in Padstow and so pleased that you find it comfortable and homely. We hope to welcome you again sometime in the future - Cathryn. The house was lovely, so convenient for the town, a matter of a few minutes walk away. The accommodation was great, very comfortable beds, lovely view, finished to a very high standard and very well equipped. We came as a family of six adults to the Christmas Festival and enjoyed every minute, especially eating at some of the best restaurants Padstow has to offer. Comummication with Cathryn was great, very helpful with her knowledge of the area. I would definitely recommend anyone to stay here, would have loved to have stayed longer. Thank you for your review. We hope all of our guests enjoy their time in Padstow as we love it there and it is great that you had a good time and found our house to be of a high standard. It is also good to hear that some of our tips were useful too! We would love to welcome you back sometime. 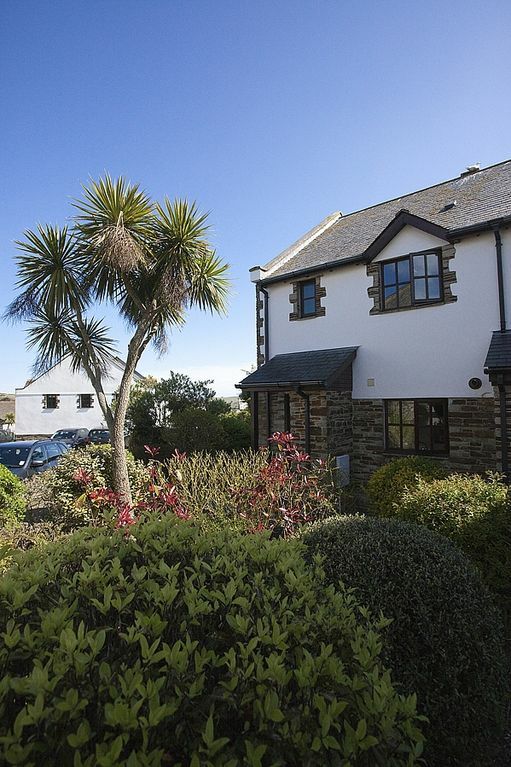 This is a really lovely house to stay in while you are in Padstow. Ideally positioned so you do not need to drive, it really is 4 minutes to the harbour. 3 adults stayed for a week and could not fault anything, I slept like a log all week. We only ate in 1 night and that was fish and chips from Rick Stein. The kitchen had all you needed, did cook breakfast and everything worked great. My only comment was the heating did not seem to come on - we did check the timer and my elderly father-in-law said he was cold. That was only on 1 evening so not a great problem. Nice views and a super week spent there. Thank you for your kind review. We are really pleased to hear that you enjoyed your stay and found the house had everyhting you needed....including comfortable beds! Though we are sorry to hear that you had a problem with the heating. We weren't aware of any issue but of course we will get this checked out immediately. However it's good to hear that this one glitch did not affect your enjoyment or your stay. It would be our pleasure to welcome you back one day. We had a lovely stay at this delightful house, ideally situated 5 minutes from the village of Padstow. The weather was not great but we had everything we needed for a lovely stay. Family at Royal Cornwall Show so ideal location for this as well. Would definitely like to stay again soon. Many thanks, plus ample parking which is a premium in Padstow. Thank you for your review and we are really pleased to hear that you found our house had everything you needed to enjoy Padstow and the Royal Cornwall Show - in spite of some typical Cornish weather! The proximity to the town as well as the ability to park is a benefit that many of our guests have told us that they appreciate. We would be delighted to welcome you back sometime in the future. Well presented house in perfect location. Lovely, clean, well appointed house. Comfortable sofas and beds and beautifully decorated. The location was just perfect for us - 5-10 minutes walk to town centre but far enough out to access easily by car without going into the chaos of the town. A couple of minutes drive up the hill there is a large Tesco. The house has private parking right outside. There are views of the estuary from the back of the house and the sun streams in in the mornings. There is a dear little patio garden furnished with table, chairs and parasol for sitting out. We loved it and would certainly return there. Thank you for your review - it is great to hear that you found the house comfortable and that it helped you to enjoy your time in Cornwall. We too have always loved the views from the back of the house - and the fact that you are close enough to the town to be able to enjoy all that Padstow has to offer, but far enough out for it to be quiet. We would love to welcome you back one day. The nearest beach is St Georges bay which can be reached on foot from the town centre. It is approx. 1 mile walk. Other beaches accessible within a 5 - 10 minute drive include Harlyn Bay, Constantine Bay and Trevone beach. The use of a car is recommended to allow you to fully enjoy the surrounding areas and beaches - though is not essential. The nearest airport is Newquay Airport which is approx. 9 miles from Padstow. Located on the North Cornwall coast, Padstow is a charming working fishing port. All the major amenities you would expect are here including banks (Barclays and Lloyds), a Post Office, Pharmacy and supermarket (Tesco). It boasts a picturesque and busy waterfront and is surrounded by dramatic coastline and spectacular scenery. The area around Padstow is designated an ‘Area of Outstanding Natural Beauty’ with lovely cliff and country walks and a choice several superb sandy beaches with no less than 7 beautiful sandy bays within a five minute drive. For foodies, Padstow is a dream destination as the town majors in fresh, locally produced food and is famous for the restaurants of celebrity chefs including Rick Stein and Paul Ainsworth. There is a weatlh of activities to do in Padstown from boat trips, fishing trips, crabbing and fishing. The Camel Trail is 18 miles of disused railway between Bodmin and Padstow which has been turned into a cycle track and walkway. Bikes can be hired in Padstow, Wadebridge and Bodmin. Booking Notes: Sorry, no pets. The property is non-smoking. Booking by email or phone. 20% deposit is required after which confirmation will be sent along with a detailed information pack in the post. Final payment along with a £200 refundable house-keeping deposit is requested within 4 weeks of your holiday. Entry to house is via access to a key safe - the code will be given on receipt of final payment. Changeover Day: Changeover day is Saturday. Arrival is after 4 pm. Departure by 10 am.